The leaves are simple, alternate, deciduous or evergreen, variably shaped depending on species, often 3 main veins with netted interveins. The stems are vine, variable, some with thorns. The flowers are small, trumpet shaped with flowers in small clusters, greenish to yellowish, dioecious. Fruit are berry, green turning red to blue or black, containing 1-3 seeds. The habitat is wide range and is a very important wildlife plant. The fruit is eaten by turkey, quail, and at least 40 species of songbirds. All the common names refer to a number of closely-related species that are vines and able to grow up trees using some combination of tendrils and thorns and propagate via runners and seeds. In Florida there are about a dozen species of Smilax found growing wild including earleaf greenbriar (Smilax auriculata), saw greenbriar (Smilax bona-nox), cat greenbriar (Smilax glauca), and everglades greenbriar (Smilax havanensis). 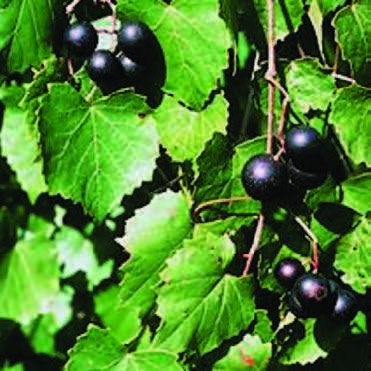 The drink called “sarsaparilla” comes from some species of Smilax roots. 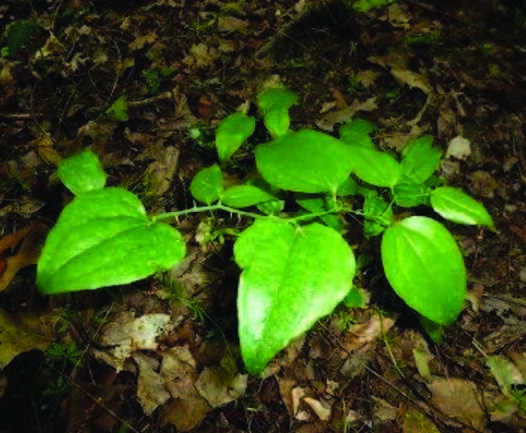 Greenbriar provides both food and protective cover and serves as an important component in the diets of wildlife including deer and black bear. 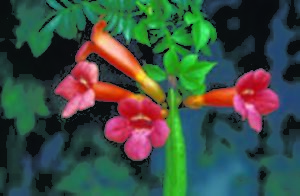 Campsis radicans is trumpet vine or trumpet creeper and also known in North America as cow itch vine or hummingbird vine is a species of flowering plant of the family Bignoniaceae. 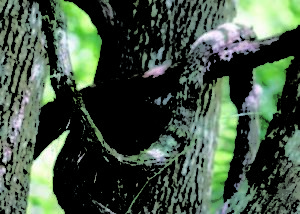 The vine is native to the eastern United States and naturalized in parts of the western United States as well as in Ontario, parts of Europe, and scattered locations in Latin America. It grows to 10 m (33 ft) and inhabits woodlands and riverbanks Trumpet vine is a vigorous, deciduous woody vine, notable for its showy trumpet-shaped flowers. and is also a popular garden subject. The leaves are opposite, ovate, pinnate, 3–10 cm long, and emerald green when new, maturing into a dark green. The flowers come in terminal cymes of 4–12, orange to red in color with a yellowish throat, and generally appear after several months of warm weather. The flowers are very attractive to hummingbirds, and many types of birds like to nest in the dense foliage. The flowers are followed by large seed pods. As these mature, they dry and split. Hundreds of thin, brown, paper-like seeds are released. These are easily grown when stratified.